Hardy roses are typically sought out for Northern regions of the United States. Able to withstand disease and winter temperatures, hardy roses come in a variety of sizes and colors and can be low maintenance. Plant roses with the ability to withstand temperature ranges in the local U.S. Department of Agriculture hardiness zone. Avoid hybrid tea roses, which are susceptible to fungi, rust and black spot. William Baffin is from the Canadian Explorer series. Requiring a large space, this rose can reach heights of 10 feet and a width of up to 7 1/2 feet. Dark pink double blooms repeat from late June until fall. The long canes can be trained as climbers or allowed to take a large shrub form. William Baffins are disease resistant and winter hardy to zone 2. 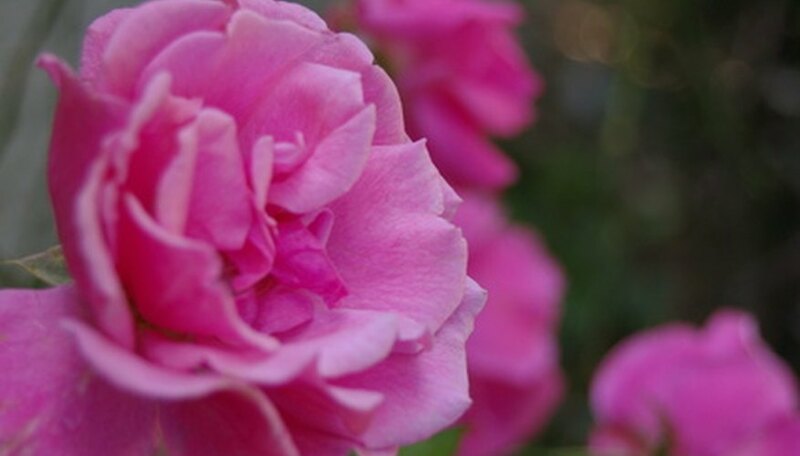 John Davis is a hardy rose with medium-pink double blooms. Canes may reach 6 feet if given support and allowed to climb. Repeat blooms can be seen from late summer until frost. John Davis is a Kordesii shrub and is hardy to zone 3. Henry Hudson is a low-spreading hardy rose. White double blooms resemble apple blossoms and repeat throughout the season. Deadheading encourages recurrent flowering. The rose's fragrance is moderate. Plants will spread up to 4 feet through suckering. Henry Hudson is another rose from the Canadian Explorer series and is hardy to zone 2. Morden blush is a smaller-growing, hardy rose of the Parkland series. Reaching heights of only 2 1/2 feet, this shrub rose has light pink double flowers. Ever-blooming Morden blush is susceptible to black spot. Plant this rose in full sun and well-drained soil for disease resistance. Able to withstand high summer temperatures, this plant is hardy to zone 3. Blanc Double de Coubert is a hardy shrub in the Rugosa class. Ever-blooming, this rose can reach a size of 5 feet by 5 feet. The blooms are white and strong in fragrance. Disease resistance and prolific blooming are best when planted in full sun, though the rose will tolerate partial shade. Blanc Double de Coubert is a bushy rose winter hardy to zone 2.